“Little Indian, Big City” is one of the worst movies ever made. I detested every moronic minute of it. Through a stroke of good luck, the entire third reel of the film was missing the day I saw it. I went back to the screening room two days later, to view the missing reel. It was as bad as the rest, but nothing could have saved this film. As my colleague Gene Siskel observed, “If the third reel had been the missing footage from Orson Welles' 'The Magnificent Ambersons,' this movie still would have sucked.” I could not have put it better myself. 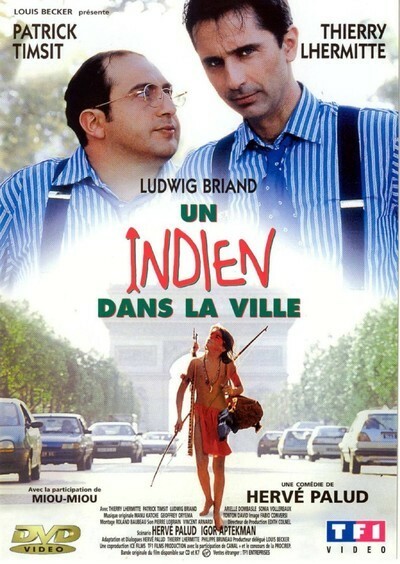 “Little Indian, Big City” is a French film (I will not demean the fine word “comedy” by applying it here). It is not in French with English subtitles, however. It has been dubbed into English, a canny move, since the movie is not likely to appeal to anyone who can read. The dubbing means that awkward, hollow-sounding words emerge from the mouths of the characters while they flap their lips to a different rhythm. In an attempt to make the English dubbing match the length of the French dialogue, sentences are constructed backward and the passive voice pops up at random. People say things like, “You have a son--you hear?” The character speaking that last line is the mother (Miou-Miou) of a boy of about 12. She was once married to the film's hero (Thierry Lhermitte), but left him 13 years earlier, when she was pregnant, because he spent too much time on the telephone. She fled to the Amazon, and has raised her child while living with an Indian tribe. Now he has flown to the rain forest to find his wife, so they can be divorced and he can marry the most stupid woman on Earth. The hero did not know he had a son--you hear? Now he meets him. The son, named Mimi-Siku (Ludwig Briand), wears a cute breech cloth, carries a bow and arrow, has a mask painted on his face, and kills snakes by biting them. His mother is an intelligent, sensitive soul who loves the environment and the rainforest. She is the only person in the jungle who speaks English (or French, in the original), so if her son learned to speak it, he learned it from her. I guess it was her idea of a joke to teach him pidgin English, so that he says things like, “Me no able read.” I guess she didn't teach him to read, either. She is depicted as kind of a secular saint. Mimi-Siku is so good with a blowgun that he can kill a fly with a dart, and often does so. He has a hairy pet spider. His father brings him back to Paris, where the movie gets worse. The father has a business partner who never knows what to wear and so always wears the same thing the father wears. Ho, ho. They go to business meetings in matching ties. Hee, hee. The partner has a daughter, and soon the son is bouncing in a hammock with a nubile 12-year-old and telling his father, “Me like you--love only one female.” I doubt if the relationship will last, since the boy is prettier than the girl. Later (or perhaps earlier, since it was in the third reel) Mimi-Siku climbs barefoot up the Eiffel Tower. This feat is handled so ineptly by the film that it has neither payoff nor consequence. He does it, and then the movie forgets it. Meanwhile, the father is doing a business deal with some shady Russians, who speak in dubbed accents and drink vodka and seem to be wearing Krushchev's old suits. The father's fiancee (Arielle Dombasle) chants mantras, plans a New Age wedding, and wants her guru to live with them. I think she's in such a hurry to get married because she's afraid the collagen injections in her lips might shift. By the end of the film, father and son have bonded, and cooked a fish by the side of the expressway. And the father has learned to kill a fly with a dart. There is a movie called “Fargo” playing right now. It is a masterpiece. Go see it. If you, under any circumstances, see “Little Indian, Big City,” I will never let you read one of my reviews again.